Workers and Students in North Carolina, Virginia and Throughout the South: Follow the Lead of Wisconsin Workers and Students! | Fight Back! Workers and Students in North Carolina, Virginia and Throughout the South: Follow the Lead of Wisconsin Workers and Students! Resistance in the U.S. to attacks on the public sector is growing. Governor Scott Walker of Wisconsin is unleashing a major assault, seeking to take away collective bargaining rights from state and possibly all public sector workers, including threatening to call out the National Guard against worker resistance. The labor movement and the students are fighting back. 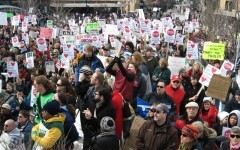 Labor, including public and private sector unions held a rally in Madison at the State Capital, turning out 30,000 people, demanding that the Governor’s bill be defeated. High school students throughout Wisconsin walked out of their schools to protest against this attack, which also affects their teachers and education. The Madison School Superintendent was forced to close the schools on Tuesday after 40 percent out of 2,600 members of the teachers union called in sick. The students see their actions as part of the growing struggles for people’s democracy that took center stage by the mass actions of the youth and workers in Tunisia and Egypt. The U.S. South is been a bastion of right-to-work laws, denying public sector workers the right to collective bargaining. Dr. Martin L. Kings lost his life supporting the struggle of the Memphis, Tennessee sanitation workers who were fighting for this right, which he saw as a next phase of the Civil Rights struggle. North Carolina and Virginia have specific laws making it illegal for workers and state and local governments to bargain for union contracts. Most of these laws were enacted during the period of Jim Crow, when Blacks were denied the right to vote and had no representatives in Southern state legislatures. When the state and local governments deny their own workers this basic right, it sends a message to all workers in the region, that the governments are hostile to unions. The lack of a concerted movement to organize public sector workers throughout the South based on a program that includes winning collective bargaining rights, has been a major factor weakening the few efforts to organize unions in the South. The major restructuring of the core industries of the U.S. economy over the past 30 years, resulted in shifting more than 1/3 of the auto industry and other formerly unionized manufacturing to the South. There are more union members in the state of New York, than in all of the 11 Southern states combined. The largely un-unionized South has undermined labor’s strength as a national movement. Organizing labor in the South must be addressed, if the U.S. labor movement is to survive and be a powerful force for workers in the U.S. and global economy. The economic crisis is increasing the competition between the states for industries and investments, in their efforts at economic recovery. The unionized states outside of the South, in their efforts to shift more public resources to private corporations through privatizations, tax breaks and major incentives, are sharpening their attacks on public sector unions to compete with the Southern states and low wage labor internationally. 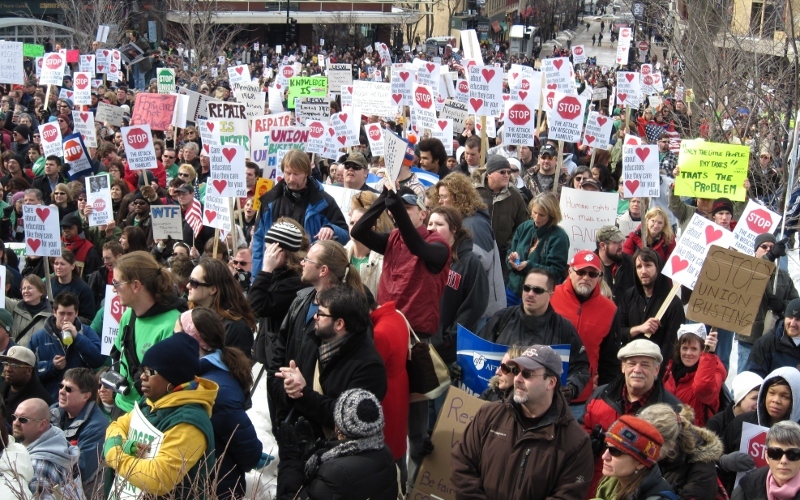 Attempts to roll back collective bargaining are now occurring in Ohio, Iowa, Nebraska and Minnesota, as well as Wisconsin. Right to work bills are pending in about a dozen Northern states. Public service jobs, wages and benefits are under attack just about everywhere. National resistance to the attacks on public sector, must therefore link the struggles against attacks to eliminate existing public sector rights to collective bargaining, with the struggles of public sector workers concentrated in the South, who are denied this right. The NC Public Service Workers Union UE-Local 150 has been in the forefront of the movement to repeal the ban on collective bargaining rights for public sector workers in North Carolina. Through its International Worker Justice Campaign, it has won a ruling from the International Labor Organization finding the U.S. and North Carolina out of compliance with international laws. In addition to fighting for collective bargaining rights, UE150 is initiating campaigns for legislative and local government workers bill of rights, pressing to make the terms and conditions of public sector workers a part of the political agendas. Public sector workers and unions throughout the South must form a Southern Alliance for Collective Bargaining Rights, to launch a region-wide movement. The South must become a strategic battleground for the U.S. and international labor movement, demanding that the U.S. and the South comply with international human rights standards. From Wisconsin to North Carolina, Virginia and throughout the U.S. South: Public Sector Workers Demand Collective Bargaining Rights Now!